1. AllMusic - Ronnie D. Lankford, Jr.
One might argue that Reckless Kelly is good at a lot of the same things other alternative country bands excel in. They've got the same nice rootsy mix of acoustic-electric instruments, and a scruffy sounding singer to deliver world-weary lyrics. But there's a difference on Wicked Twisted Road, and that's in how the band -- guitarist David Abeyta, fiddler Cody Braun, singer Willy Braun, bassist Jimmy McFeeley, and percussionist Jay Nazz -- puts it all together. From the get-go, the band shows its ability to deliver songs like the title track and "Dogtown" in the most natural, unaffected manner. The latter unwinds at a nice, lazy pace perfectly suited for Willy's vocal and harmonica solo. In other words, Reckless Kelly never gives one the impression that it's striking an alternative country pose consisting of one part talent and two parts attitude. The band also knows how to stretch itself stylistically. "Seven Nights in Eire" offers a surprising mix of Celtic and country and blending fiddles and steel guitar, while "Sixgun" offers brash, country-rock. 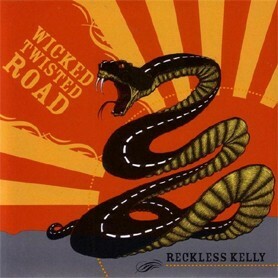 If Wicked Twisted Road is a tale of life and love on the road, then Reckless Kelly has told it well. Fans will appreciate the solid effort, while everyone else -- who's never quite gotten around to checking out the band -- will find it a nice introduction.